Bicycle Jacked Up!, developed byThe United States Playing Card Company, is the company’s innovative attempt to keep up with in an increasingly digital world. 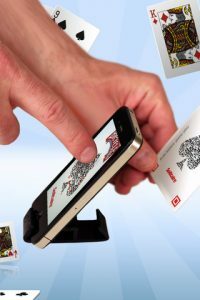 The app itself is free, but in order to use it to full effect, you need to purchase a set of physical playing cards from a brick and mortar retailer or an online retailer. Once you manage to obtain a deck of cards, you can use them in conjunction with the app to play with your friends. The game’s rules will change with each hand of play, which keeps the gameplay surprisingly fast-moving and fun. 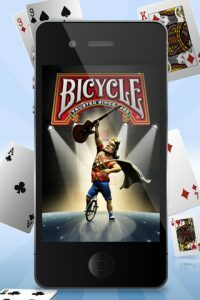 Classic games that can be played in conjunction with the app include Hearts, War, and Solitaire. 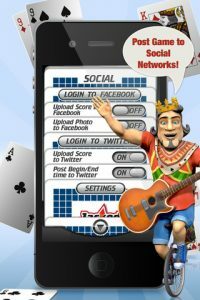 One of the best parts of adding an iPhone element to traditional card gameplay is that the in-app host will keep score for you, allowing you to focus on the fun. And thanks to the game’s relatively decent UI, it’s pretty easy to find your way around. The Joker character who acts as your virtual host is called Jack, and he’s a little annoying. He lacks the charm or specificity of earlier virtual host entities, like the classic creepy host from the old school game “Atmosfear,” which was trying out the whole video host thing way back in 1991. That being said, Bicycle’s Joker character is fairly innocuous, though we wish he had more verve. Also, what’s up with the unicycle? Shouldn’t he be on a bicycle, given what company he’s shilling for? 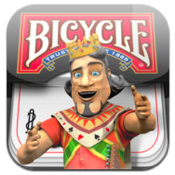 All in all, Bicycle’s offering is worth checking out if you’re really into card games, but want to spice things up a bit. We can imagine it would be a great way to encourage intergenerational gaming on Family Night, and that’s always a good thing. 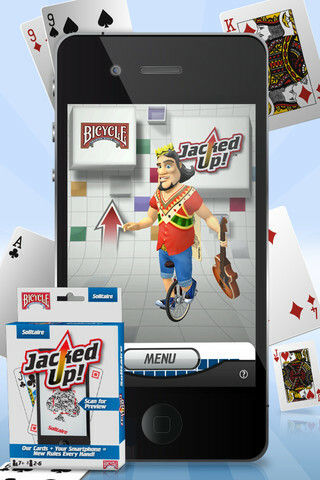 Bicycle® Jacked Up!™is compatible with iPhone, iPod touch, and iPad. Requires iOS 4.0 or later.